The IBM® Worklight® mobile application platform helps you to develop, deploy, host, and manage mobile enterprise applications. It also enables companies to integrate security into their overall mobile application lifecycle. 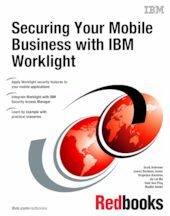 This IBM Redbooks® publication describes the security capabilities offered by Worklight to address mobile application security objectives. The book begins with an overview of IBM MobileFirst and its security offerings. The book also describes a business scenario illustrating where security is needed in mobile solutions, and how Worklight can help you achieve it. This publication then provides specific, hands-on guidance about how to integrate Worklight with enterprise security. It also provides step-by-step guidance to implementing mobile security features, including direct update, remote disable, and encrypted offline cache. Integration between Worklight and other IBM security technologies is also covered, including integration with IBM Security Access Manager and IBM WebSphere® DataPower®. This Redbooks publication is of interest to anyone looking to better understand mobile security, and to learn how to enhance mobile security with Worklight.